SANAA, Yemen A drive-by shooting Thursday that killed a top Yemeni security official who worked at the U.S. Embassy in Sanaa has raised concern that al Qaeda militants here are bouncing back and getting bolder after suffering defeats this year in a U.S.-Yemeni military offensive. Al Qaeda in Yemen has carried out a string of assassinations of top security and military officials and deadly suicide bombings in recent months. Security officials said they believe it has a hit list to kill more in an attempt to paralyze Yemen's new leadership installed this year and throw the anti-al Qaeda assaults into turmoil. In Thursday's attack, embassy security official Qassem Aqlani was on his way to work when a masked gunman on a motorcycle opened fire on him and fled the scene, officials said. The attack was near Aqlani's home in western Sanaa, while the embassy is located in the eastern part of the capital. Aqlani, who was in his 50s, had been working for the embassy for 11 years, the U.S. State Department said. In Washington, a senior State Department official told CBS News, "we are deeply saddened by this tragic incident involving a Yemeni employee of our embassy in Sanaa, and we are working with Yemeni authorities." Yemeni security officials said the attack was similar to previous assassinations by al Qaeda, although they said it was too early to confirm the group's involvement. The officials spoke on condition of anonymity because they were not authorized to talk to the press. There are increased concerns over security at American embassies in the region after last month's deadly attack by militants against a U.S. diplomatic mission in Benghazi that killed the U.S ambassador to Libya and three other Americans. Protesters also stormed several U.S. embassies in Arab nations  including the one in Sanaa  in outrage over the film denigrating the Prophet Muhammad. Thursday's shooting in Sanaa took place exactly one month after the Benghazi assault. An elite team of around 50 U.S. Marines sent to bolster security at the Sanaa embassy after the Sept. 13 attack was scheduled to leave the country later Thursday, Yemeni officials said. It was not clear whether Aqlani's slaying would affect those plans. There was no sign of increased security around the U.S. Embassy in Sanaa, which has already been heavily fortified with new protective measures amid the turmoil surrounding last year's uprising against then-president Ali Abdullah Saleh. Security was tightened even more after the protesters stormed the compound last month. They climbed over the walls, damaged some buildings and took down the U.S flag before they were driven out by Yemeni soldiers. But officials said they believe it was not the anti-Islam movie that led to Thursday's killing, but that it was part of al Qaeda's campaign of retaliation for heavy blows the group has suffered in recent months. Washington considers the Yemen-based al Qaeda in the Arabian Peninsula, or AQAP, to be the most dangerous offshoot of the terror network after it was linked to several attempted attacks on U.S. targets, including the foiled Christmas Day 2009 bombing of an airliner over Detroit and explosives-laden parcels intercepted aboard cargo flights last year. The group made major gains in Yemen last year amid the uprising that led to Saleh's ouster. Its militants and their allies seized several towns and cities in the south of the country. But Saleh's successor Abed Rabbo Mansour Hadi has worked closely with the U.S. in pushing the group back. An offensive by Yemeni troops backed by U.S. airpower and advisers drove militants out of the southern cities and into mountain refuges. Airstrikes, believed to be by U.S. drones, have killed a number of key al Qaeda operatives, including AQAP's deputy leader, Saeed al-Shihri, and six others traveling with him in a car last month. Two weeks ago, a top intelligence official, Col. Abdullah al-Ashwal, was killed in a drive-by shooting in Sanaa by his own informant, who appeared to be working for al Qaeda. Over the summer, a suicide bomber killed Maj. Gen. Salem al-Quton, the top commander of the southern region who led the war against al Qaeda. Col. Abdullah al-Maouzaei, charged with hunting down members of al Qaeda, was killed when his vehicle blew up as he turned on the ignition outside his home in the southern port city of Aden. A top intelligence official in Sanaa and Omar Barsheed  who headed the Military Academy and was nominated to head presidential guards  both died in similar bombings. The press secretary of the president escaped an assassination attempt. One of the worst attacks took place on May 21 when a suicide bomber  who turned out to be a son of a colonel - blew himself up in the middle of military rehearsal killing nearly 100 of them. A month later, al Qaeda suicide bomber detonated his explosives among a crowd of Yemeni police cadets, killing at least 10. Officials said that detained al Qaeda members confessed that the slain officials were on a hit list that includes many of Hadi's men, particularly those he depends on in his war against al Qaeda. Hadi has reached out to tribal leaders in the south, trying to secure their help against al Qaeda, after many of its militants who fled this year's offensive took refuge in tribal-controlled areas in the mountains in the southern and eastern parts of the country. During the offensive, the Yemeni military has often relied on local tribal militias for help. On Tuesday, while meeting with tribal leaders from Shabwa province  a one-time stronghold of al Qaeda  Hadi pressed for unity with the government, warning that the government "will not tolerate anyone who helps al Qaeda." But al Qaeda is sending signals to the tribes as well. 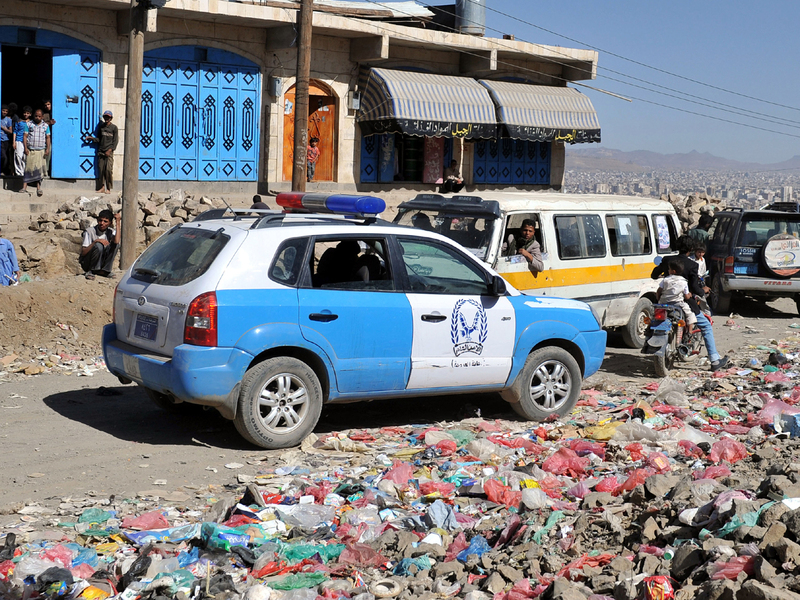 Authorities on Tuesday discovered three decapitated bodies dumped in an open-air market in the eastern province of Marib. Local media reported that CDs found next to the bodies showed the men confessing to being government informants against al Qaeda and admitting they had put tracking devices on cars that became targets for U.S. drone strikes. One of the men said he worked for a tire repair shop and used to plant chips in militants' vehicles while replacing their tires.